In this guide, we will discuss how to install and configure the Bind9 DNS server as authoritative-only DNS servers on Ubuntu 14.04 machines. We will set these up two Bind servers for our domain in a master-slave configuration. To complete this guide, you will first need to be familiar with some common DNS terminology. Check out this guide to learn about the concepts we will be implementing in this guide. You will also need at least two servers. One will be for the "master" DNS server where the zone files for our domain will originate and one will be the "slave" server which will receive the zone data through transfers and be available in the event that the other server goes down. This avoids the peril of having a single point of failure for your DNS servers. Unlike caching or forwarding DNS servers or a multi-purpose DNS server, authoritative-only servers only respond to iterative queries for the zones that they are authoritative for. This means that if the server does not know the answer, it will just tell the client (usually some kind of resolving DNS server) that it does not know the answer and give a reference to a server that may know more. Authoritative-only DNS servers are often a good configuration for high performance because they do not have the overhead of resolving recursive queries from clients. They only care about the zones that they are designed to serve. For the purposes of this guide, we will actually be referencing three servers. The two name servers mentioned above, plus a web server that we want to configure as a host within our zone. After completing this guide, you should have two authoritative-only name servers configured for your domain zones. The names in the center column in the table above will be able to be used to reach your various hosts. Using this configuration, a recursive DNS server will be able to return data about the domain to clients. Before we get into the configuration of our name servers, we must ensure that our hostname is configured properly on both our master and slave DNS server. We want to complete the same procedure on our slave server. Your servers should now have their host definitions set correctly. On each of your name servers, you can now install Bind, the DNS server that we will be using. Run this installation command on your master and slave DNS servers to acquire the appropriate files. 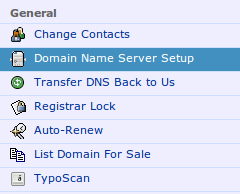 Now that we have the software installed, we can begin by configuring our DNS server on the master server. The first thing that we will configure to get started is the named.conf.options file. The Bind DNS server is also known as named. The main configuration file is located at /etc/bind/named.conf. This file calls on the other files that we will be actually configuring. The main thing that we need to configure in this file is recursion. Since we are trying to set up an authoritative-only server, we do not want to enable recursion on this server. We can turn this off within the options block. The next step that we need to take is to specify the zones that we wish to control this server. A zone is any portion of the domain that is delegated for management to a name server that has not been sub-delegated to other servers. We are configuring the example.com domain and we are not going to be sub-delegating responsibility for any portion of the domain to other servers. So the zone will cover our entire domain. This file will initially be empty besides comments. There are other zones that our server knows about for general management, but these are specified in the named.conf.default-zones file. Inside of this block, we add the management information about this zone. We specify relationship of this DNS server to the zone. This is "master" in this case since we are configuring this machine as the master name server for all of our zones. We also point Bind to the file that holds the actual resource records that define the zone. Next, we are going to define the reverse zone for our domain. If the organization that gave you your IP addresses did not give you a network range and delegate responsibility for that range to you, then your reverse zone file will not be referenced and will be handled by the organization itself. In instances like these, since you have not been allocated a chunk of addresses to administer, you should use this strategy. The strategy outlined below is covered for completeness and to make it applicable if you have been delegated control over larger groups of contiguous addresses. Reverse zones are used to connect an IP address back to a domain name. However, the domain name system was designed for the forward mappings originally, so some thought is needed to adapt this to allow for reverse mappings. In a domain, the most specific portion is of the address is on the left. For an IP address, the most specific portion is on the right. The most specific part of a domain specification is either a subdomain or a host name. This is defined in the zone file for the domain. Each subdomain can, in turn, define more subdomains or hosts. All reverse zone mappings are defined under the special domain in-addr.arpa, which is controlled by the Internet Assigned Numbers Authority (IANA). Under this domain, a tree exists that uses subdomains to map out each of the octets in an IP address. To make sure that the specificity of the IP addresses mirrors that of normal domains, the octets of the IP addresses are actually reversed. So our master DNS server, with an IP address of 192.0.2.1, would be flipped to read as 1.2.0.192. When we add this host specification as a hierarchy existing under the in-addr.arpa domain, the specific host can be referenced as 1.2.0.192.in-addr.arpa. Since we define individual hosts (like the leading "1" here) within the zone file itself when using DNS, the zone we would be configuring would be 2.0.192.in-addr.arpa. If our network provider has given us a /24 block of addresses, say 192.0.2.0/24, they would have delegated this in-addr.arpa portion to us. We have chosen to name the file db.192.0.2. This is specific about what the zone configures and is more readable than the reverse notation. We have told Bind about our forward and reverse zones now, but we have not yet created the files that will define these zones. Now, we can use some of the pre-existing zone files in the Bind directory as templates for the zone files we want to create. For the forward zone, the db.local file will be close to what we need. Copy that file into the zones subdirectory with the name used in the named.conf.local file. The first thing we need want to do is modify the SOA (start of authority) record that starts with the first @ symbol and continues until the closing parenthesis. We need to replace the localhost. with the name of the FQDN of this machine. This portion of the record is used to define any name server that will respond authoritatively for the zone being defined. This will be the machine we are configuring now, ns1.example.com. in our case (notice the trailing dot. This is important for our entry to register correctly!). The next piece we need to edit is the serial number. The value of the serial number is how Bind tells if it needs to send updated information to the slave server. Note: Failing to increment the serial number is one of the most common mistakes that leads to issues with zone updates. Each time you make an edit, you must bump the serial number. One common practice is to use a convention for incrementing the number. One approach is to use the date in YYYYMMDD format along with a revision number for the day added onto the end. So the first revision made on June 05, 2014 could have a serial number of 2014060501 and an update made later that day could have a serial number of 2014060502. The value can be a 10 digit number. Next, we can get rid of the last three lines in the file (the ones at the bottom that start with @) as we will be making our own. The first thing we want to establish after the SOA record are the name servers for our zone. We specify the domain and then our two name servers that are authoritative for the zone, by name. Since these name servers will be hosts within the domain itself, it will look a bit self-referential. Since the purpose of a zone file is mainly to map host names and services to specific addresses, we are not done yet. Any software reading this zone file is going to want to know where the ns1 and ns2 servers are in order to access the authoritative zones. You can add any additional hosts that you need to define by creating additional A records. Reference our DNS basics guide to get familiar with some of your options with creating additional records. Now, we have the forward zone configured, but we need to set up the reverse zone file that we specified in our configuration file. We already created the file at the beginning of the last section. Again, wipe out the lines under the closing parenthesis of the SOA record. We will be taking the last octet of each IP address in our network range and mapping it back to that host's FQDN using a PTR record. Each IP address should only have a single PTR record to avoid problems in some software, so you must choose the host name you wish to reverse map to. For instance, if you have a mail server set up, you probably want to set up the reverse mapping to the mail name, since many systems use the reverse mapping to validate addresses. The configuration for the master server is now complete, but we still need to implement our changes. Before we restart our service, we should test all of our configuration files to make sure that they're configured correctly. We have some tools that can check the syntax of each of our files. First, we can check the named.conf.local and named.conf.options files by using the named-checkconf command. Since both of these files are source by the skeleton named.conf file, it will test the syntax of the files we modified. If this returns without any messages, it means that the named.conf.local and named.conf.options files are syntactically valid. If you run into any other messages, it means that you have a problem with your zone file. Usually, the message is quite descriptive about what portion is invalid. Keep an eye on this log to make sure that there are no errors. Now that we have the master server configured, we can go ahead and get the slave server set up. This will be significantly easier than the master server. We will make the same exact modifications to this file that we made to our master server's file. Here, we will create each of our zone specifications like we did on our master server. However, the values and some of the parameters will be different. This time, we are going to set the type to slave since this server is acting as a slave for this zone. This simply means that it receives its zone files through transfer rather than a file on the local system. Additionally, we are just going to specify the relative filename instead of the absolute path to the zone file. The reason for this is that, for slave zones, Bind stores the files /var/cache/bind. Bind is already configured to look in this directory location, so we do not need to specify the path. When you are finished, you can save and close the file. We do not actually have to do any of the actual zone file creation on the slave machine because, like we mentioned before, this server will receive the zone files from the master server. So we are ready to test. If this returns without any errors, it means that the files you modified have no syntax errors. You should see some entries that indicate that the zone files have been transferred correctly. Your authoritative-only name servers should now be completely configured. However, you still need to delegate authority for your domain to your name servers. To do this, you will have to go to the website where you purchased your domain name. The interface and perhaps the terminology will be different depending on the domain name registrar that you used. 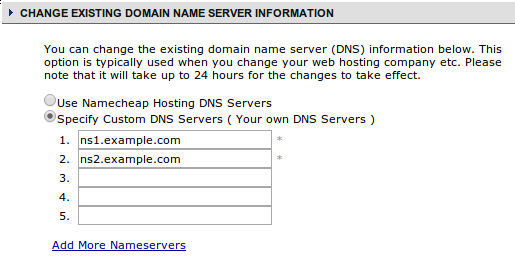 In your domain settings, look for an option that will allow you to specify the name servers you wish to use. Since our name servers are within our domain, this is a special case. Instead of the registrar simply delegating authority for the zone through the use of NS records, it will need to create a glue record. A glue record is an A record that specifies the IP addresses for the name servers after it specifies the name servers that it is delegating authority to. Usually, the delegation only lists the name servers that will handle the authority of the domain, but when the name servers are within the domain itself, an A record is needed for the name servers in the parent zone. If this didn't happen, DNS resolvers would get stuck in a loop because it would never be able to find the IP address of the domain's name servers to follow the delegation path. So you need to find a section of your domain registrar's control panel that allows you to specify name servers and their IP addresses. 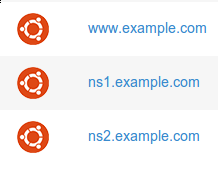 As a demonstration, the registrar Namecheap has two different name server sections. This will create the A record that that serve as the glue records that you need in the parent zone file. The changes might take awhile to propagate, but you should see the data from your name servers being used within the next 24-48 hours for most registrars. You should now have two authoritative-only DNS servers configured to server your domains. These can be used to store zone information for additional domains as you acquire more. Configuring and managing your own DNS servers gives you the most control over how the DNS records are handled. You can make changes and be sure that all relevant pieces of DNS data are up-to-date at the source. While other DNS solutions may make this process easier, it is important to know that you have options and to understand what is happening in more packaged solutions. DNS, or the domain name system, is an essential component of modern internet communication. It allows us to reference computers by names instead of IP addresses. In this series, we will cover the basic ideas behind DNS so that you feel comfortable working with it. Afterwards, we will walk through various ways that you can gain greater control over your domains and DNS resolution. DNS, or the Domain Name System, is an integral part of how the internet functions today. However, the way that DNS works is often quite mysterious for new administrators. In this guide, we will discuss some of the common terminology and concepts that are involved in DNS configuration. DNS is a robust system that is absolutely essential in modern internet communication. Through a combination of delegation, redundancy, and caching, a client can receive the precise address of any of the system's servers or sites by querying a complex network of computers for a simple name. In this article, we will discuss some of the different kinds of DNS servers that work together to make this possible. We will go over the advantages of each type and why you would choose one over another. This article explains how to manage your DNS records using the DigitalOcean Control Panel and can help you decide if DigitalOcean's DNS management tools are right for your situation. Bind is an extremely flexible DNS server that can be configured in many different ways. In this guide, we will discuss how to install Bind on an Ubuntu 14.04 server and configure it as either a caching or forwarding DNS server. Leveraging a DNS server configured like this can help speed up DNS queries for client computers. Bind, the most popular DNS server, is used as the backbone of much of the world's DNS system. In this guide, we will discuss how to configure a pair of DNS servers to act as master and slave authoritative-only DNS servers for your domains. We will be demonstrating this on Ubuntu 14.04. In this tutorial, we will go over how to set up an internal DNS server, using the BIND name server software (BIND9) on Ubuntu 14.04, that can be used by your Virtual Private Servers (VPS) to resolve private host names and private IP addresses. This provides a central way to manage your internal hostnames and private IP addresses, which is indispensable when your environment expands to more than a few hosts. NSD is an authoritative-only DNS server that is optimized to serve zone information quickly and efficiently. While some other DNS solutions provide value through their flexibility, NSD focuses on doing one task extremely well. In this guide, we will demonstrate how to configure NSD to authoritatively serve a domain on two servers in a master-slave configuration. We will be using Ubuntu 14.04 as the host system.